The play opens at the Moscow Audio (Cassette) Fair where Katya is trying to secretly get a manuscript to Barley Blair for publication. Barley has skipped the show so the manuscript travels to London with a friend of Barley's who, when he is unable to track down Barley, takes the manuscript to the authorities. It is then subsequently taken to the "Russia House" where the manuscript is found to be political dynamite. The author claims that a lot of things in Russia don't work properly and that scientific evidence has been fabricated. To ensure that the manuscript is not a fake, the authorities (intelligence services) have to track down Barley and persuade him to go back to Russia to find the author. Will Barley agree and will he be able to do it successfully? Set at a time when Russia was opening up, The Russia House is a tale of betrayal, sacrifice and love, both for country and for individuals. I found it fascinating and gripping and it's still quite complicated despite its running time of only just over 3 hours - compared to the 400 page book. There are a few familiar voices in the cast, the main one being Tom Baker as the likeable cad Barley. No-one says Harry quite like he does! The public-school tones of Pip Torrens are equally recognisable as Clive, a bureaucrat who excels in protecting himself. 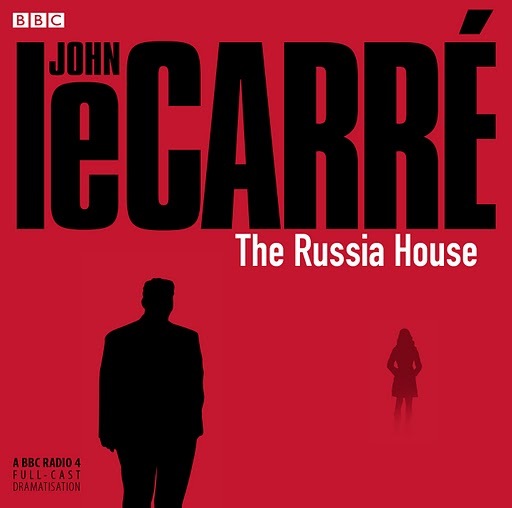 The Russia House was published in 1989 and this radio adaptation was broadcast in 1994 and, as well as the different state of the world back then, it shows its age a little in terms of cassettes and the fact that spies have tape recorders rather than wireless eavesdropping equipment, but it does give an intriguing insight into how things were politically, not so long ago. Though I have enjoyed books by relative newcomers to the spy writing genre such as Stella Rimington and Jon Stock, I've never read any le Carre - I've been convinced I wouldn't understand them - but this has given me a chance at least to sample the great man's writing. In conclusion, another entertaining listen from Radio 4/AudioGO. Karen - Thanks for the fine review. I'm glad that you enjoyed your first taste of le Carré. I've always thought that most of his work is excellent thriller stuff. Hopefully you'll get the chance to sample some of his other books and see what you think. Sounds good, Karen. I haven't read any Le Carre for a while, I always used to read them as they came out but they got a bit too polemical for me. Maybe I should return to this. Am I imaginging it or did they make a film of this one with Sean Connery? I can imagine Tom Baker's voice being brilliant for this, though. Thanks I will check it out, I have read 'the constant gardner', which was hard going, but I think I would prefer the spy stuff to that.